Winter Park Veterinary Hospital utilizes the most state-of-the-art diagnostic equipment so that we can provide a more thorough and accurate diagnosis of many medical conditions that your pet might be experiencing. X-ray is an imaging tool that provides a non-invasive method of examining your dog or cat’s internal organs and internal systems such as muscular-skeletal, cardiopulmonary (heart and lungs), gastrointestinal, reproductive and urinary systems. The image quality of a digital x-ray is much higher than a film x-ray and there is no time lost in processing the image. The digital images can be visualized within a few seconds following exposure, allowing us to diagnose and treat your pet rapidly. Digital radiology is environmentally friendly because there are no chemicals to contaminate water systems and it decreases radiation exposure to your pet as images can be manipulated via a computer. Digital dental radiography allows us to visualize the internal anatomy of your pet's teeth along with the roots and surrounding bone. Most serious periodontal disease is below the gum line requiring dental x-rays to diagnose. Radiographs allow us to diagnose bone loss or hidden disease that may be present in the tooth roots and jawbone areas that may not have been visible during our thorough oral exam prior to the exam. Having digital dental capability allows us to sedate, exam, x-ray, and clean your pet’s teeth in around 30- 45 minutes depending on the severity of the cleaning and the number of extractions required. Endoscopy is a minimally-invasive procedure that aids us in the diagnosis of disease and emergency situations. It allows us to view inside your pet’s body and visualize the organs and internal systems without performing surgery. Endoscopy involves the use of endoscopes, or small cameras, which can be guided throughout your pet’s body via small incisions or naturally-existing orifices. The endoscope is a tube with a camera and light on the tip. We are able to take biopsies utilizing specialized instruments inserted through a channel in the endoscope. Ultrasound is a diagnostic imaging technique that allows us to look at organs in three dimensions (in 3-D). It also allows us to recover samples for testing from the organs of the abdomen or chest such as the liver, kidneys, spleen or heart. Veterinary ultrasound is a painless, non-invasive and safe tool allowing visualization of tissues not otherwise possible. Ultrasound typically does not require sedation unless internal tissue samples are collected. If a biopsy is required, we are able to safely obtain those samples using the ultrasound as a guide. We use a state of the art machine for monitoring your pet’s ECG, blood pressure, respiration, heart activity, oxygen saturation and temperature during all surgical procedures. 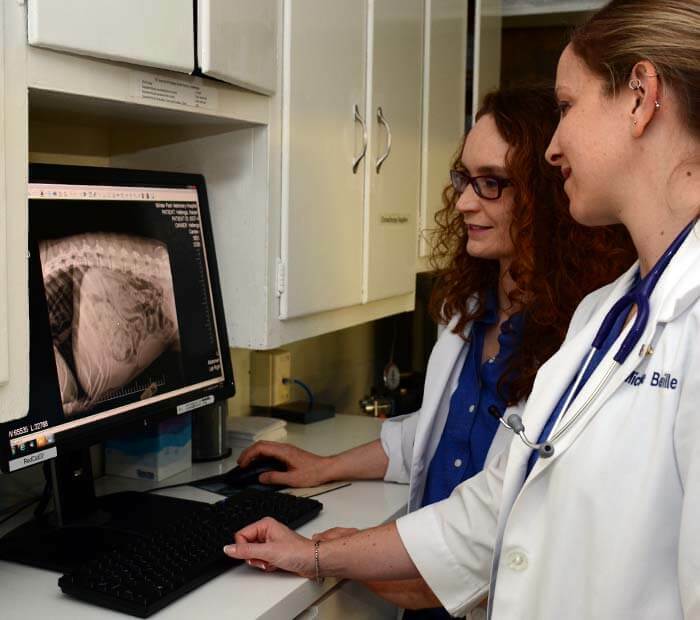 Our in-house laboratory and state of the art digital radiology equipment allow us to quickly and thoroughly evaluate your pet’s health and provide immediate diagnostic care during an emergency. We have the same emergency lab equipment used in thousands of human hospitals throughout the country. If your pet becomes ill or has been injured, our in house diagnostic tools allows for immediate, life-saving treatment without having to wait for a specialty hospital or outside lab. With our lab and other diagnostic equipment we have answers in minutes and can start treatment immediately.